Hunter Brayton of Coldwater, MI. is 16 years old and was born on 1-29-1999. He is 5’11” and weighs 140 lbs. August 2008 age 9 Hunter started racing karts at Michiana Raceway Park in North Liberty Indiana. He competed in 3 races. In 2009 Hunter raced the full club schedule of 13 races in the Rookie 1 class with 15 competitors in his class. Hunter won 2 races and finished in the top 5 several times on his way to a 3rd place finish in the season points championship. In 2010 Hunter raced the full club schedule of 13 races in the Rotax Mini Max Class. Hunter won 2 races and finished in the top 5 several times on his way to a 4rd place finish in the season points championship. Hunter also competed in the Rotax Grand National Event and finished in the top 20. At the 2010 MRP season championship Banquet, Hunter won 2 awards; “Most Improved Junior Driver” and the coveted “Hard Charger Award” a $1,000 scholarship given in the name of Pat Delahanty. Hunter also finished in the top 15 nationally in the Rotax Mini Max standings out of over 100 drivers. In 2011 Hunter finished 3th overall at Michiana Raceway Park near South Bend, IN competing in 12 races in Mini Max class and also finished 3rd in the Yamaha Junior Sportsman Class while only competing in half of the season events. At the final race of the season Hunter broke the track record in the Yamaha Junior Sportsman Class. 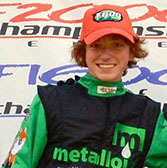 Hunter won 4 races in 2011 at MRP; (3 Yamaha and 1 Mini Max), competed in the Pan American Challenge series for Rotax, and competed in WKA Man Cup. In 2012 Hunter competed in 5 of the 6 WKA Manufacturers Cup races in the Junior Sportsman Class finishing in the top 20 in points nationally. It was his first year racing Yamaha in WKA and he had a best finish of 9th at Daytona. Racing for Team Birel it was a great learning experience with some bad luck mixed in; so the results were not a true benchmark of how he competed. Also the fact that the top 20 karts were separated by just a couple tenths of a second made the competition great and the experience even greater. Hunter also raced 3 events in the Junior Rotax class. In 2013 Hunter competed in the Rotax Junior Max at Michiana Raceway Park. With a class of 15 karts the competition was likely the best club racing in the country and he was very fortunate to be able to compete there. No wins but 5 top 5 finishes out of the 7 events that he competed in. Hunter also completed the Skip Barber 3 driving day school at Lime Rock Park so he would be able to compete in SCCA in 2014. He was the youngest driver in his class to graduate. In 2014 Hunter competed in the F600 Challenge at Mid-Ohio July 5-6 qualified P-3 and finished 7th due to electrical issue and then backed that up with qualifying P-5 on Sunday running 3rd most of the race before finishing 4th behind 2 time SCCA National Champion Brian Novak. At Barber Motorsports Park Hunter qualified P-3 and finished 3rd in the first race then had a steering hub failure in the second race. In the final race at Road Atlanta Hunter qualified 2nd and finished 2nd. It was a very good rookie season for Hunter in the F600 challenge; placing 4th in the season point’s championship despite not competing in the first 4 races. The Brayton family has a long history in racing starting with Lee Brayton in sprint cars and Indy Cars. Scott Brayton had a 15 year career in Indy Cars highlighted by back-to-back Pole Position starting spots in the 1995 and 1996 Indy 500 and (2) 6th place finishes at Indy. Brayton Engineering Inc. has built and developed engines for Indy Cars, Sprints, and Midgets since 1983 and built the winning engine for the 1998 Indy 500. Lee and Scott were inducted into the Michigan Motorsports Hall of Fame in 1998.